Yesterday, while showing off our mostly/kinda/sorta/mainly done pool table room, I promised a little tutorial on how I made these roman shades. Pretty blah, and there just wasn't enough color on that side of the room, specifically crimson, which is the color of our couch cover on the other side of the room, and the color of our pool table felt. So curtains were in order, of some kind. But the narrow space between the top of the window frame and the ceiling would make hanging curtains hard. Not the mention that floor length curtains would overpower these smallish windows, and probably get in the way of playing pool. Plus, there was the fact that I really wanted to use the leftover scrap fabric from making this couch cover, but I really didn't have that much fabric left to do much. So roman shades it would be, since other than a valance, roman shades take about as little fabric as possible to still cover a window. And not just any roman shades, but non-permanent ones that utilize the mini blinds already hung on the windows! But I'll get to that in a minute (and you could totally modify this to make them permanent if you wanted too). First up, the making of the shades themselves. First, I measured our windows, and cut out my fabric accordingly, giving myself an extra 3 inches or so for seams. However, because I was working with a limited size and amount of fabric, I ended up cutting out 4 panels of fabric, two for each window, because that was the only width I had. I just used a pen to mark off the cutting lines on the back of the fabric, because nobody was going to see it with my attaching-to-the-mini-blinds plan. After cutting my fabric to size, I measured out and drew lines in equal portions, so I would later know where to attach the fabric to the blinds, so it would fold in typical roman shade fashion. Then, I folded my fabric and ironed it down, to set the stage for where my seams would go. I didn't bother folding it under twice, to hide the rough edge because 1) nobody will see the back once it's done, so it didn't matter, and 2) because this is pretty thick fabric, and it would just make things harder. Once I had my two "middle" seams ironed down (the seams that would connect the two fabric panels into one big enough to cover the window), I lined them up, inserted some Stitch Witchery, and pined them together. Once my middle seam was done, I opened up the fabric, and ironed the seam fabric down to one side. Repeat the same process of fold and iron down, insert Stitch Witchery, and slowly iron, press, iron to seal the seams down. Do this on 3 of the 4 outer sides of your fabric panel, leaving the top unfinished (since it won't show, so no point in wasting your time!). Basically, your roman shade is now ready to hang. However, when I flipped it over to iron out the wrinkles, I found that I wasn't really liking the look of the two joined fabric panels. It just looked too much like....two pieces of fabric trying to pose as one! But I had a quick fix in mind. Using almost the very last of my fabric scraps, I had just enough to make two 4 inch wide center accent pieces. Which I then ironed around my 2 inch ruler, inserted Stitch Witchery into, and ironed flat. I was then left with a 2 inch wide accent strip that added some interest to the shades, and also covered up my middle seam. I just put some Stitch Witchery between the accent strip and the curtain, pined in place to make sure it would be straight, and ironed away. On my finished bottom side, I just folded the accent strip around and added more Stitch Witchery to hold it in place. Lather, rinse and repeat to make your second roman shade, and you're ready to hang them! So, you could go a couple different ways here, if you so choose. You could use glue to attach the shades permanently to your mini blinds if you wanted. Or you could always try to figure out how to add string to make them into traditional roman shades, and forgo using the blinds at all. But as far as what I did, I went the completely non-permanent route (since we're renters), and basically just sewed the roman shades to the mini blinds! First, I removed the angle adjusting stick from the min blinds. Then I tucked the unfinished top of the fabric up over the top rail of the mini blinds, and taped them into place at the height I wanted them. Next I took a needle and matching thread and stuck it through the fabric at the top of the blinds, right where the fabric folded over the top. I proceeded to wrap the thread tightly around the top of the blinds, looping the thread down the length of the blinds, securely attaching the fabric to the top. Here's a peek looking straight up at the top rail of the blinds, where you can see my looped thread holding the fabric in place. Then, remember those lines I drew in equal increments across the fabric at the beginning? Use those as a guide to repeat the same thread looping process, but this time looping the thread around the blinds themselves. Make sure your stitch through the fabric is pretty small though, so it won't be noticeable from the front. One tip I did learn after attaching the first shade, is that it's a lot easier to do your thread looping if you fold the fabric up on the drawn guide lines and then pin it into place. Then you're not worrying about holding the fabric up with one hand and sewing with the other. And that's basically it. Once you've sewn the fabric to the top of the blinds, and made your three rows of loops around three individual blinds, just pull up the string and you've got roman shades! Unfortunately I couldn't get the lighting right to get a picture with them all the way raised to work, I think I needed to wait until there wasn't bright sun shining through. But oh well, I think I prefer them half raised anyway, it still lets light in, but leaves enough crimson fabric visible to get the balance of colors I was looking for over on that side of the room. 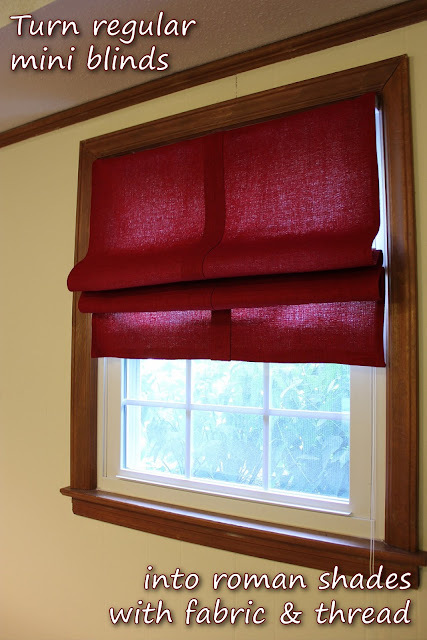 Have you ever made your own shades or curtains before? Or found a way to modify your mini blinds in a non-permanent way? I'm hanging on to this tutorial - they look amazing! So freaking cool! You've inspired me to tackle our patio door...one day. I'm kind of lazy, and this looks like a lot of work. Never made curtains (or sewed/stich-witched anything before). You are so talented, and I think the finished product is so great and creative! You did an awesome job! I've never attempted something like this before and probably wouldn't have the patience. LOL. the blinds turned out really well! love the color you chose. Great idea! And sooooo easy! Thanks for sharing this!! Great idea, can't wait to try. You Are Not A Deer!